Reading this book makes me wish that I was the kind of hyper-focused blogger who only reviewed alphabet books. 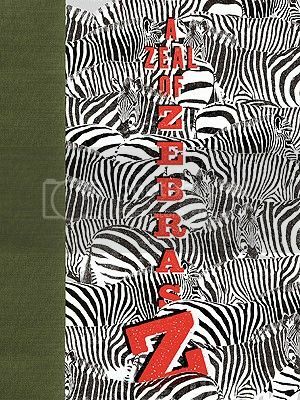 I could call myself The Amazing Abcedarian, and then, after reading A Zeal of Zebras, confidently proclaim it to be the best alphabet book in all the land, and probably one of the most superior alphabet books of all time. Each page is a fresh and original surprise as readers are treated to a collection of animals referred to by their group name, paired with some interesting information about each animal, and a gorgeous digitally created collage. While some of these group names were not unfamiliar to me: a caravan of camels, a galaxy of starfish, and of course, an unkindness of ravens, I wondered if the others were simply made up such as: an aurora of polar bears, an embarrassment of pandas, an implausibility of gnus. I found this site with a wonderful list confirming the names of several rarely used animal group names; how neat! Woop Studios background as a graphic design firm is apparent in the crisply designed, textured collage images. Any of the pages would be frameable as art. Many have the look of old movie posters and blurred or scratchy edges indicative of handmade prints. I loved the nest of crocodiles, all meeting nose to nose, except for one, who has his tail to the rest of the group. My personal litmus test for any alphabet book is the treatment of the often difficult letter "X". A Zeal of Zebras offers a not-too-shabby "exaltation of larks" for X - I can't give it full-marks for the most ingenious "X" I've ever seen, but I must say, I've definitely seen worse. Pair this book with Ubiquitous by Joyce Sidman for a beautiful and innovative look at different animal species. Abcedarian is a great word. And like you, I'm in love with this book, too. Entrancing! Yeah, it's not often that I root for an oversize book, but in this case, the slightly-large size was just perfect.